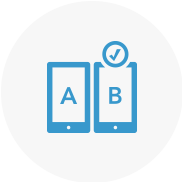 “A/B Testing” is actually pretty simple in principle. We create multiple versions of one webpage and observe how users react to the differences. Sometimes subtle changes to the layout or content of a website can have a sizable impact on the way a user interacts with the site. Something as simple as moving a link from the top of a page to the sidebar – or even just changing its color – can be the deciding factor as to whether or not a customer converts. A/B Testing is a way of finding those factors. So it Helps Fix Problems? Yes and no. A/B Testing isn’t so much about fixing something that’s broken, it’s about making something that already works work better. It’s about optimization. Imagine you’re looking at a map trying to figure out the route you want to take to work. The map is great at giving you a rough idea, but there are some questions it can’t answer. Should I take the freeway and risk traffic, or take the side streets and hit more lights? Naturally, you could guess, but the only way to really know for sure is to actually drive them both and compare. Both routes will get you where you’re going, but one is going to get you there faster. To be frank, yes; A/B Testing is an invaluable to modern web development. Design philosophy and common sense are valuable too, of course, but they’re only going to get you so far in figuring out how best to reach your customers. There’s ultimately no substitute for experimenting. At a certain point you simply have to try a few different things to find which way works best. There’s a tradeoff. By definition you’ll be investing in web assets that are eventually going to get tossed in the bin in favor of their better performing counterparts. The cost/benefit analysis of building more assets for your site in pursuit of finding the perfect ones will vary based on the assets that are targeted and the specific goals of your business. In general, though, an upfront investment that turns a site which works really well into one which works perfectly is going to be worth it. Alright, I’m Intrigued. How does it Work?